Serves as the legislative branch of County Government. 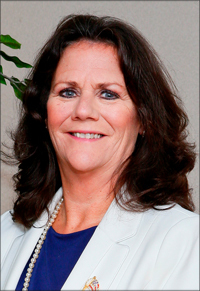 Maureen Kern, a lifelong resident of Somers Point, was elected District Two Freeholder in November 2015. She holds the distinction of being elected the first woman to hold the position of Freeholder Vice Chair in Atlantic County’s 182 year history. A powerful voice for women’s issues, Maureen is an advocate for those who suffer with mental health issues and the disabled. She serves as the Freeholder liaison to the Atlantic County Institute of Technology Board and Special Services School District Board, the Disability Advisory Board and the Mental Health Advisory Board. Maureen has been dedicated to community service throughout her life following in the footsteps of her late father Lawrence “Bud” Kern’s legacy of commitment and betterment of the community. His outstanding example of volunteerism coupled with a strong work ethic resulted in the formation of the Somers Point Good Old Days Festival held annually in his memory. Maureen is a member and past co-chair of the Good Old Days Committee who awards scholarships to Somers Point youth that demonstrate prideful commitment to community involvement and the spirit of volunteerism. Maureen volunteered for many years on the Foundation for Education, which supports annual projects and new educational ventures, while raising awareness for the schools through special events and a significant community presence. She was elected to the Somers Point Board of Education from 2002 to 2009, serving on many committees including Budget and Personnel. Prior to serving on the Board of Education she was elected as Somers Point Recreation Commissioner from 2001 to 2008. Maureen launched her public service career in 2009 when elected to the Somers Point City Council. In 2012 she was elected and served as Council President until 2015. Maureen, the only female on Council during her tenure, was an integral part of establishing the City’s vision and master plan. She formed a strong economic development team and initiatives to promote Somers Point as a destination location at no additional cost to the taxpayers. Maureen graduated from Montclair State University with a Bachelor’s degree in Business Administration. She started her professional career in tourism at Caesar’s Atlantic City and has been involved in promoting “Atlantic City,” with focus on marketing conventions and corporate meetings since 1979. She currently holds the position of National Sales Manager at Tropicana Casino and Resort and is a member of Meeting Professionals International. Maureen’s education and experience is an asset to the Freeholder’s Tourism/Economic Development Committee. Married to Jay Phillips, they are the proud parents of three sons Buddy, David and Bryan.